Yesterday evening, in true Italian fashion, a group of Umbra students discovered the importance of the Mediterranean tradition of stimulating the appetite before a meal with what is known as the aperitivo. Seventeen students and Umbra staff member Paul Schiller went to the hip Lunabar Ferrari on the main thoroughfare to socialize in true Italian spirit. 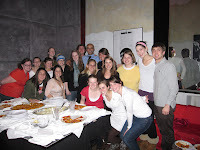 Before the actual drinks arrived, the students learned about the history of the aperitivo. There is no consensus about the origin of the aperitivo itself, but the word is derived from the Latin verb aperire which means “to open.” Some say the concept of drinking a small amount of alcohol before a meal dates back to the ancient Egyptians. Records show that the aperitivo may have first appeared in 1786, when Antonio Benedetto Carpano invented vermouth (fortified wine with spices) in the city of Turin. Aperitivo was already widespread in the 19th century in Italy, where being served in fashionable cafes in Rome, Venice, Florence, Milan, Turin, and Naples. Typical drinks are small glasses of wine, cocktails made from Campari, or prosecco. Italian students often meet for an aperitivo, enjoying a small drink and lots of finger food for a low price. Umbra students did just that, and acquired perhaps a new taste for the popular bitter/sweet Campari Orange. Students learned that the aperitivo that most of the cafes offer can be great place to make appointments with their new Italian friends.